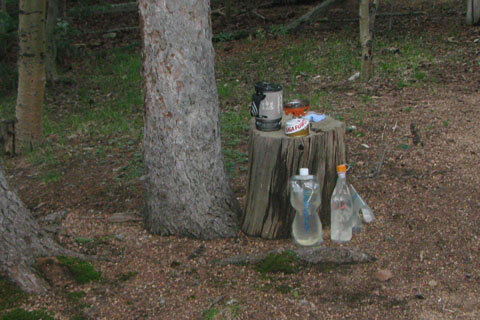 The Bleuet was the first backpacking stove that I used. The canister of gas for this odd little stove did not have a valve. 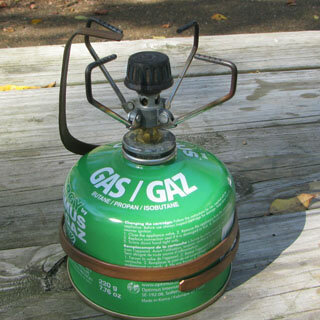 Instead the burner set on top of the gas container with two arms extending from the burner to encompass the gas container and hook under the bottom of the can. A sharp tip valve was then screwed into the gas container puncturing the cartridge and a gasket sealed the hole. One of the many problems with the Bleuet stove was that you could not se per ate the stove from the canister, until it was empty. This meant, you were walking around with the gas stove ready to use, like it or not. I think I lost more gas by accidentally turning the knob in my pack than using it as a stove. Canister stoves have come a long way. Now days, most of the canister stoves work well in warm conditions; but some still suffer in performance as the temperatures fall. In recent years the cold weather performance has improved especially with the MSR Reactor and Jetboil stoves. These stoves tend to capture the heat better which leads to faster boil times in all weather conditions. Fuel has also improved over the years. Most fuel canisters contain a mixture of fuels to optimize performance. All the fuel canisters also have valves that allow you to screw the burner onto the gas and unscrew the can when you finished using it. Another improvement in the canisters is the ability to recycle them. Jetboil makes a nice canister puncture tool which allows the residual gas to escape and makes the can recyclable. The canister stove is basically maintenance free. The only part Jetboil sells is the piezo igniter. The canister stoves are very easy to use. Some stoves are a bit contrary to light when using a full canister of gas. Bleed a little gas and then try lighting it. Practice cooking on the stove at home (outdoors). Find what kind of meals cook better on the stove. For example, we have stoves that only do well boiling water - so we take foods like instant potatoes or rice that only require adding water. With a little tinkering the canister stoves can cook most recipes; but it is better to find out what cooks well on the stove while you are at home than while on a backpacking trip. We take new cartridges (full) on backcountry trips and use the partly full canisters when car camping. Use a partial wind screen around the stove to block winds. Winds will effect the performance of the stove. Position the stove behind a wind block or build a temporary wind block (a pack generally does a good job). Warning: Do not use a wind block that completely surrounds the stove (like those commonly used with a gas stove). The canister stove generates too much heat and can melt knobs or even explode. I have never seen one explode; but I have melted a knob before! When used in cold weather some canister stoves do not perform well. To improve performance keep the canister warm before using it. Keep it in a jacket pocket or cozy up to the metal container in your sleeping bag. While using the canister in cold weather place the canister in a dish or pan of water or put a hand warmer package under the can. My friend, Mark, made a heat exchanger out of copper tubing to help warm a canister for cold weather use. It was almost too effective as the copper got really hot! The heat exchanger dramatically improved the performance of a lightweight stove. Please recycle the gas containers! The Jetboil Sol Ti is our favorite stove. We are going to do another review of the stove after we use it over the winter. We have heard from friends that the MSR Reactor is remarkable; but we have never used one. The stoves such as the MSR Pocket Rocket and Snow Peak Giga Power are lightweight and compact but they are not great performers.